Heads up! Game 1 of the Finals is open for picks at fantasypostseason.com ! Pick! Pick! Pick! Why Durant? No particular reason. You can say home game and best available player before injury or fatigue sets in. Okay, yeah, maybe! But I pick him just because my guts tell me to. 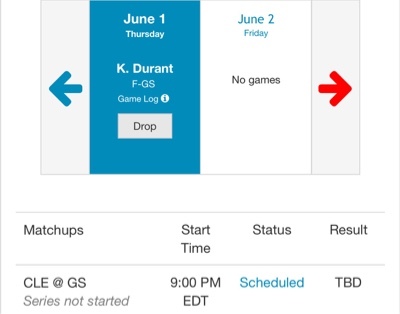 I have my whole Warriors and Cavs pool before me, and I can only hope for seven games in the Finals for me to capitalize on what I have. At rank 48, 87 percentile and trailing the leader by more than 100 points, I can't fathom getting the trophy. But let me see if I can overtake some of us readers from this blog. Some of you have already used one or two from these two teams back in the (unexciting) Conference Finals, and it will do you good if these Finals finish earlier. And if it happens to extend, these two teams have several 20 PRA players even outside the Big 7. Make your pick! In FP and Google Drive. Good luck! UPDATE: Kevin Durant's special shoe only for sale while he's on court for Game 1. Will Durant be motivated to produce more to promote the shoe? They need a W, not a showcase. Too many days waiting for the Finals...I hope finally we will watch a real close series. This is the moment we were waiting for. Also whoever wants to write up something and post as blogger, I can give you privs to do so. Ah, I can post again. Since the conference finals were so short I am only missing out on Kevin Love (and Zaza Pachulia), so of course, the more games the merrier. That said I am not sure how the Finals will play out. My plan right now has the four stars in the first four games. The Warriors at home (Curry in g1, Durant in g2), the Cavs in Cleveland (Kyrie in g3 and LeBron in g4). Then D Green for g5, provided he is on the court, and the Thompson twins for the final matches, I am not sure these are even needed. Plans, of course, are made to be changed. Let´s see how it´s going to go. The Finals! Finally, we can hopefully get some competitive games. I'd be nervous having the entire pool of Warriors and Cavs like you do Taong. Chances of it going 7 games aren't that great. Not that these teams aren't closely matched, it's just chances of any series going 7 games is always below 50%. For myself, I'm glad I've picked Durant and Love already. I'm prepared for 5 games, and have a couple of decent options left for if it goes longer in Tristan Thompson and possibly Andre Iguodala. For tonight's game 1, I've got Draymond Green. Not any particular reason, just hoping he gets off to a strong start in the series. Congratulations Taong, and the rest who picked Durant. He was great, and Cavs defense really awful to stop him. I bet they will try to defend him better in next games. Probably it was the right time to pick him. Thanks but I think KD's best PRA will come in an off-night Curry game. Klay Thompson was downright disgraceful last night giving me red with a lowly 13. As a result I've dropped from 11th to 16th uugh! He is absolutely awful now that the Warriors are stacked and he is 4th fiddle to SC, KD and DG!!!! !